Meri K. asks: Who invented pole vaulting? Although it’s difficult to find written accounts, it appears that people have been propelling themselves through the air with poles since ancient times. In fact, depictions of people leaping with poles can be found as far back as 400 BC. A practical and inexpensive way to traverse swampy marshy areas, propelling over wet places on poles has traditionally been a common practice in the fens of Cambridgeshire, Lincolnshire, Norfolk and Huntingdonshire, UK, as well as the marshes of the Netherlands. As the bogs and estuaries were drained and developed, it became custom for residents to keep jumping poles for use while walking around outside. Not restricted to the countryside, vaulting water with poles has also been a popular technique employed by Venice’s gondoliers, when moving from their watercraft to shore. 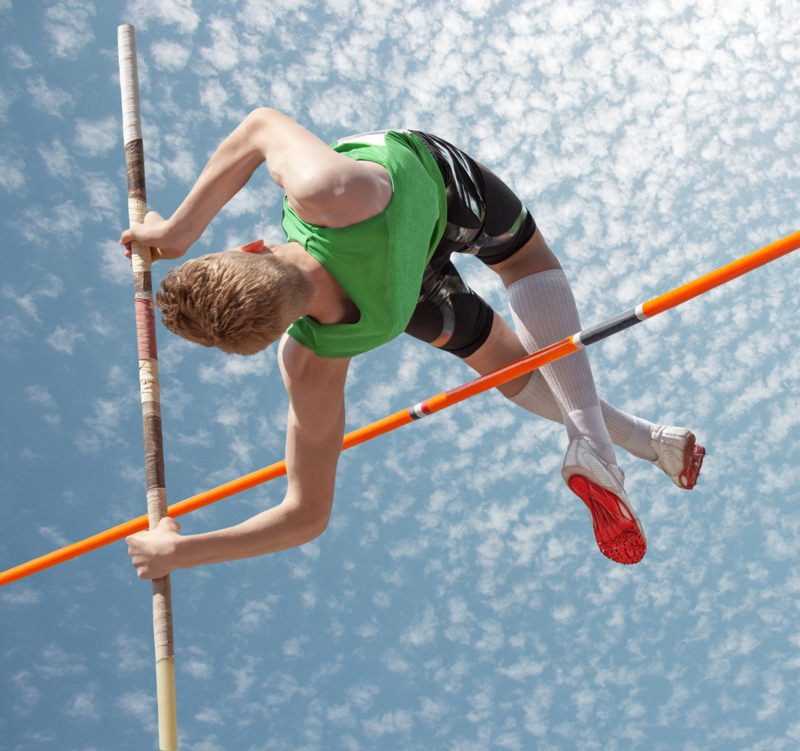 Over the years, pole vaulting changed from being a pragmatic mode of transportation to a sport. In 1843, the idea of competing for height as opposed to distance was pioneered at an early contest at Ulverston Football and Cricket Club in Lancashire. By 1850, competitions in the sport were being held routinely in Germany, and by the mid-19th century, the techniques we see today were already in use in the U.S. Although the poles were formerly made of aluminum or bamboo, by the 1950s, modern composites such as fiberglass were substituted – making for a stronger, yet equally light, pole that enabled vaulters to reach even greater heights. Having quick reactions while sailing through the air, if he happened to hit the cross bar, Volz would “reach out with his left hand, grab the bar and steady it on the standards while suspended in midair.” Giving himself a distinct advantage, “Volzing” allowed Volz to try for ever greater heights, and set new records. Having good success early, he raised the American record twice in 1982 (to 18′ 10.5″), but injuries that year to his left ankle had a lasting effect. Unable to make the Olympic team in 1984 and 1988 (he broke his right leg in multiple places in 1987), Volz surprised everyone when he finally made the U.S. Olympic Team in 1992 – and took fifth place. It shall be a failure if . . . during the vault, the vaulter steadies or replaces the bar with his/her hand(s). I am a retired news reporter that edits books for friends. Mr. Bob Bienvenu is seeking permission to use the image of the pole vaulter pictured on todayifoundout.com as the cover for his sequel to a Father’s Love Christian fiction book entitled,”A Father’s Love the College years.